The most common activated sludge operating problems causing poor plant performance are related to solids separation. Especially common are bulking and foaming. Without a proper scientific foundation to support the efforts of wastewater treatment plant management, many attempts to thwart bulking and foaming have failed. 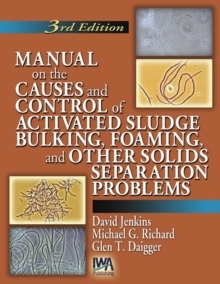 Manual on the Causes and Control of Activated Sludge Bulking, Foaming and other Solids Separation Problems provides the critical scientific and practical underpinnings needed to understand and combat these problems. The third edition of this flagship text is a comprehensive, concise guide to the microbiological and technical aspects of controlling all types of solid separation problems. The scientific theory is applied to real-world scenarios, greatly increasing the number of real-world examples of successful control methods. New information is also included on filamentous organism growth and its application in the control of sludge bulking and foaming. Now plant operators, regulators and wastewater engineers have a complete guide for battling these formidable design and operating problems. Features of the Manual include: Discussion of the mechanisms of the bioflocculation involved in the formation of activated sludge flocs Many new case histories of the practical diagnosis and resolution of activated sludge solids separation problems Re-examination of the filament backbone concept of floc structure, with additional focus on strong flocs that are devoid of filamentous organisms Analysis of bulking and foaming caused by nocardioform organisms and Microthrix parvicella, with emphasis on their origins and control methods New photographs and descriptions of filamentous organisms responsible for bulking and foaming Results of recent studies of activated sludge and previously unknown microorganisms - and the potential use of molecular biological tools in diagnosing bulking and foaming problems.